The drinks flow pretty freely on the Cape in summertime. Ask around about the best bartenders on the Cape and one name almost always enters the conversation: Chatham’s Ian Kelley, who has gone from hotshot at the old T.G.I. Friday’s to the slightly more refined setting of the historic Chatham Bars Inn, which is celebrating its 100th anniversary this year. 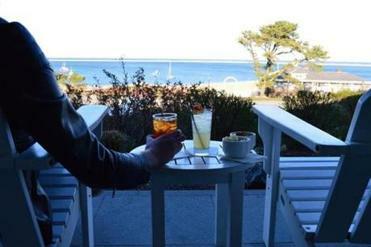 With cocktail or coffee in hand, guests can enjoy the oceanside view from the front porch of the Chatham Bars Inn, which celebrates its 100th anniversary in 2014. Q. I’ve seen a lot of confusing claims about the origins of the Cape Codder, with references to Trader Vic’s and Ocean Spray. Do you have any special insight into that? A. Um, not so much. But it’s definitely one of the top drinks, anywhere I’ve ever worked. I’m local, born and raised. I’ve worked at quite a few bars all over the Cape. Q. What is the Chatham Bars Inn doing to celebrate the anniversary? A. We had a big centennial dinner, a whole ’20s-era-themed party about a month ago. Did the whole Prohibition-type thing, with the flapper dresses. People were dressing up kind of gangster. There was a big band. It was pretty nice. Q. Did they make you sneak in the back door? A. Yep. In the main bar, they made it look like a speakeasy. There was a slider window, and you had to bang on the door and give a password to be able to get in. Q. Did you wear the bands on your arms? Q. 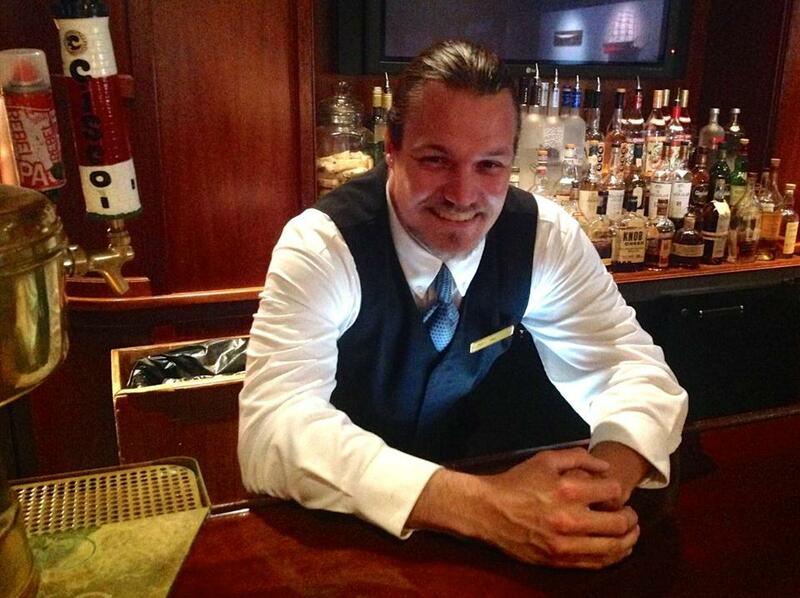 For most bartenders, it’s a ladder, and you’re near the top at the Chatham Bars Inn. I’m sure there’ve been a range of places you’ve worked, and people you’ve served. A. Absolutely. Every restaurant is different. Every bar I’ve worked in, I’ve picked up a piece of knowledge. At T.G.I. Friday’s I learned how to do bar flare, and I actually did competition – Tom Cruise-style, like in “Cocktail,” flipping bottles. That was a pretty cool experience. Q. I don’t imagine they want you flipping bottles at the Chatham Bars Inn. A. Not so much. Maybe down at the beach bar. Q. On your off days, do you hang out at the Squire, or do you avoid the bars altogether? A. Both. The Red Nun, I go to that bar often. It’s a little less chaotic in the summertime than the Squire, which is pretty jacked, always. You want to kind of get away, find a quiet corner to hang out in. Q. What’s the secret to being named one of best bartenders on the Cape? Do you have a short list? A. Honestly, personality is number one. You’ve got to be able to talk with anybody, make them feel comfortable. Q. But when you’re busy, you can’t chitchat, but you have to let them know you’re still taking care of them. A. Right. There’s a happy medium. You still interact, but you crank out the drinks you need to make. Q. Besides flare, do you have a specialty? A. I created a drink at CBI called a Shipwreck Martini. That sells pretty strong. It’s Malibu rum, banana liqueur, a little curacao, pineapple juice, and a splash of seltzer. Q. And a large glass of water. That sounds like a ready-made hangover. A. Yes, it’s sweet. It’s a pretty drink. The garnish is cherry and orange, and you flip it over so it looks like the shape of a ship. Q. You have a new baby? A. We have a baby boy, four months. Q. That changes your lifestyle big-time. You’re flipped upside down. I assume you used to sleep until noon? A. Oh, yeah, definitely. I was nocturnal: sleep half the day, until the next shift. Now it’s not much sleep. I work all night, then I’m up with the baby. 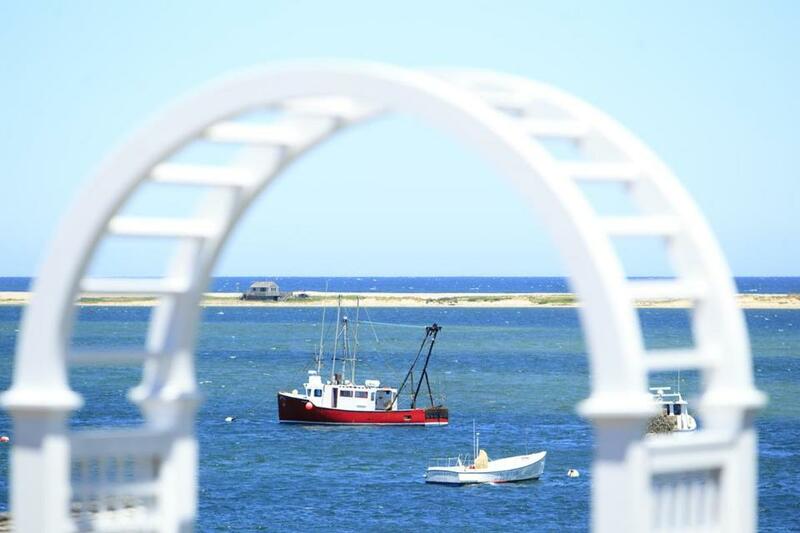 The view from the Chatham Bars Inn.